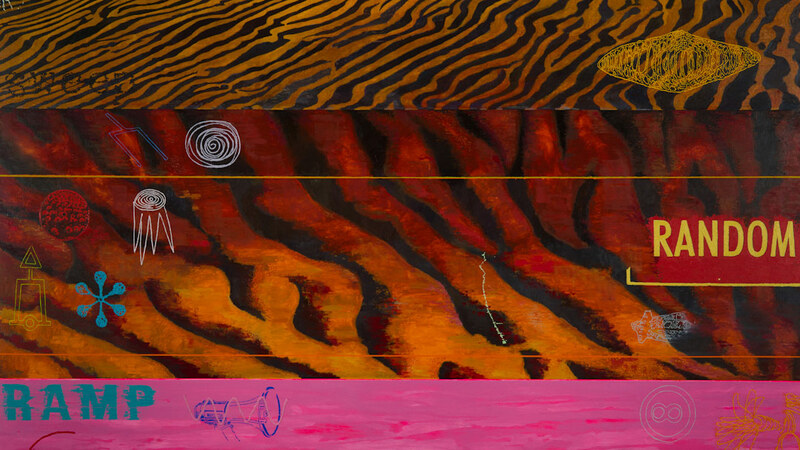 Derrick Buisch's intensely colorful paintings straddle the border between everyday visual information and a world of richly layered abstraction. Buisch thinks of his art as a collision of signs, symbols, letters and fragments of other art with new combinations of color, texture and design. Together, these elements arrive at what he calls an "optically charged field." Over the past 18 years, Buisch has been exploring the territory between what he describes as his immediate landscape and multiple versions of non-objective abstraction. His studio practice involves a kind of workbook activity wherein sketching takes the form of indexing, listing, charting, and graphing, with the goal of building visually dense paintings with layered references. The viewer is presented with a rewarding adventure in color, shape and the mystery of the images' origins. Tom Hollenback's art reflects concerns about environmental sustainability and our use of water resources. Having spent much of his adult life in the arid Southwest, Hollenback is acutely aware of patterns of water usage and the fragility of the balance between supply and demand. His art reflects the directed movement of water and the structures and mechanisms that make it available to us. Inspired and concerned by the industrial movement of water from remote natural places to cities like Los Angeles and Las Vegas, Hollenback's sculptural pieces incorporate structures that are metaphors for capture, control, and flow. Using fluorescent acrylic, steel, and flexible tubing to mimic the movement of water yet resonate with an eerie detachment from it, he prompts us to ponder the transformation of a natural resource into a controlled commodity. The beauty and highly finished qualities of Hollenback's sculpture parallel the manufactured structures that make our lives comfortable, provide all sorts of sustenance and seem to protect us from nature's unpredictability. His art also prompts us to question the balance between our needs and their impacts on the world around us. These exhibitions are supported by the Wisconsin Arts Board with funds from the State of Wisconsin and the National Endowment for the Arts. Ongoing support for the Watrous Gallery comes from DoubleTree Hotel-Madison and Robert & Carroll Heideman. I focus on abstract painting informed by ordinary, everyday visual information. Twelve years of painting abstractly provides me with a fertile working territory. The major concentration in this body of work is the development of an idiosyncratic, abstract visual language. Like the best artists of any era, Tom Hollenback creates art that subtly transforms the perceptions of the viewer. His sculpture, no matter where it is installed, immediately defines and underscores the space it inhabits, thus changing the experience of being in that situation.